Early Booking Bonus – Book Now with PES for Big Savings! Book Now with PES for Free Signature Beverage Package, Free Specialty Dining at the Pinnacle Grill, Free or Reduced Fares for Kids & 50% Reduced Deposit! 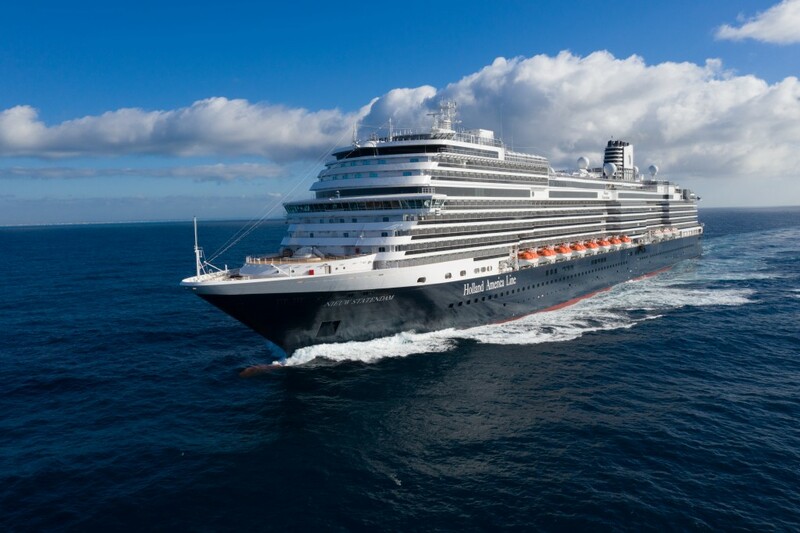 Plus, $100 Shipboard Credit Per Person when you Book a Suite! Early Booking Bonus Ends May 31! The healthcare industry worldwide continues to face challenges and obstacles with providing quality healthcare and patient outcomes with continuing budgetary and resource challenges. Healthcare delivery is focusing more on prevention at the community level to meet these challenges. Scandinavian countries, including Norway, have by necessity developed a healthcare delivery model combining population-based public health principles and prevention with clinical medicine due to their isolated locale and limited resources. Through professional exchanges with in-country practitioners, this program explores Scandinavia’s commitment to primary care as key to improving population health, how to effectively deal with the aging population while keeping rising healthcare costs down, and how to keep up with and utilize the newest technology. By design, this program offers opportunities for medical professionals to compare and contrast cultural perspectives with current best practices in their own professional setting. During this program, we will be looking at varied practice models from hospital and clinics. Each have a unique approach; however, we all desire the same outcome. 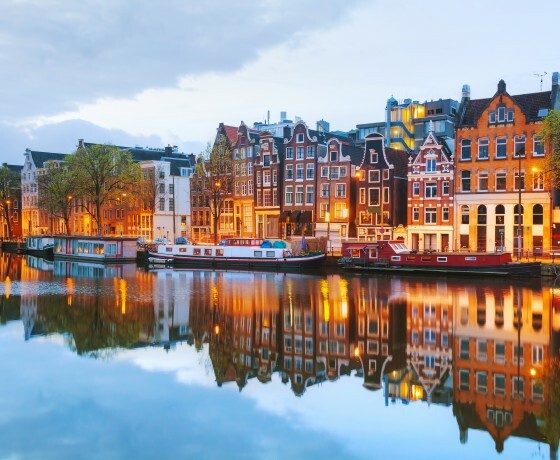 Educational Goals: Our goal is to provide unparalleled CME/CE travel opportunities for healthcare professionals that combine their most passionate destination desires with their educational goals, fostering exceptional learning experiences, friendships and connections with national and international colleagues. Learning Objectives: Keep abreast of rapid expansion of medical knowledge and current best practice models on multiple topics to facilitate change and thus provide continually excellent patient care. Physicians: Programs are reviewed by the American Academy of Family Physicians for a minimum of 14 Prescribed Credit Hours. AAFP Prescribed credit is accepted by the American Medical Association as equivalent to AMA PRA Category 1 credit(s) toward the AMA Physician Recognition Award. When applying for the AMA PRA, Prescribed credit earned must be reported as Prescribed, not as Category 1. Dentists: The Professional Education Society is an ADA CERP Recognized Provider. ADA CERP is a service of the American Dental Association to assist dental professionals in identifying quality providers of dental education. ADA CERP does not approve or endorse individual courses or instructors, nor does it imply acceptance of credit hours by boards of dentistry. The Professional Education Society designates this activity for a minimum of 14 continuing education credits. Nurses: The Professional Education Society is approved by the California Board of Registered Nursing, Provider Number CEP 5428, for up to 14 contact hours. Although the California Board of Registered Nursing does not approve individual continuing education courses, providers are required by law to be approved by the Board. Reciprocity for continuing education hours for nurses is available in most states. Please check with your regulation board regarding requirements. For Other Healthcare Professionals: Certificates of Attendance are issued to all participants attending credit sessions and can be submitted for credit approval to their professional board. In order to receive a Certificate of Attendance, registrants must sign-in, attend the programs and complete a program evaluation. Tax Deduction: This healthcare seminar has been designed to comply with current IRS convention rules and deductibility requirements under Code Section 274(h)(1) as directly related to the conduct of the attendee’s profession and meeting the reasonableness standard of the foreign seminar rules. The formal meetings will be scheduled with lectures and discussions. Seminars in conference rooms, clinics or hospitals will be conducted by in-country speakers as well as distinguished faculty of the Professional Education Society. Documentation verifying the scheduling dates, locations, hours of attendance, certificate of participation, and appropriate certificate of continuing medical, dental or nursing education will be provided at the completion of the conference. Tax deductible benefits are not guaranteed and we recommend that every attendee should consult with their Tax Consultant about their Individual situation to determine the appropriate amount and reporting of deductible expenses. Join PES and cruise majestic fjords, sail across the Arctic Circle to witness the remote beauty of North Cape, and explore small villages surrounded by breathtaking scenery and steeped in Viking history! Jun 20 Sat At Sea – Summer Solstice Celebration! In the shadow of snowy peaks and near stunning blue-green fjords, Eidfjord is considered by many to be one of the most beautiful villages in Norway. Even though it has a population of less than 1,000, scores of visitors come here each year to bask in the area’s natural splendor. 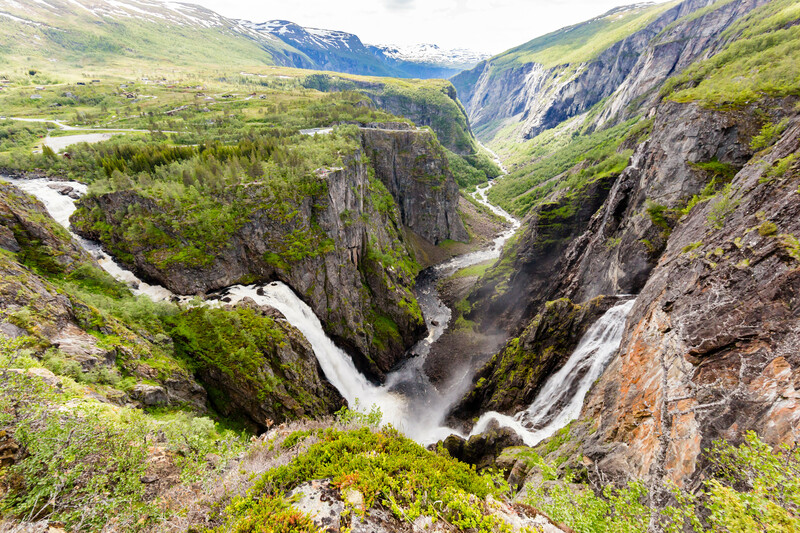 Hardangervidda, near Eidfjord, is Europe’s largest mountain plateau as well as Norway’s largest national park. Interestingly, the legendary polar explorer Roald Amundsen, who led the first expedition to reach the South Pole, and Fridtjof Nansen, who made the first successful crossing of the Greenland interior, both used Hardangervidda to prepare for their expeditions. Walking, hiking, cycling and cross-country skiing are popular, and the area is home to Europe’s largest population of wild reindeer. 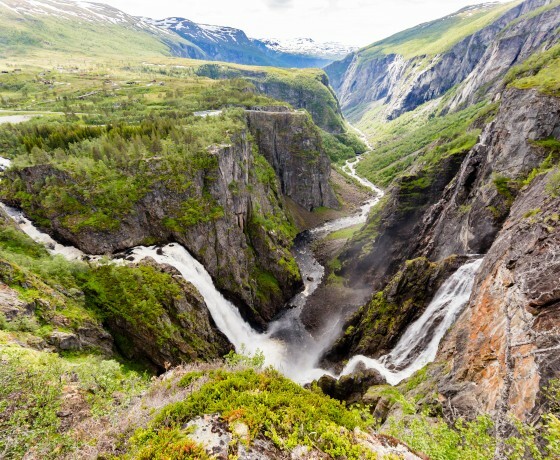 Numerous canyons, including the famous Måbødalen Valley, lead south from the Hardangervidda plateau to the fjords along the coast, and about 10 miles south of Eidfjord, visitors can see the dramatic 597-foot-tall Vøringfossen waterfall. In the center of Eidfjord stands the 14th-century stone Eidfjord Kirke, while outside town the famous Kjeåsen Mountain Farm sits on a ledge 1,968 feet above the Simadalsfjord. 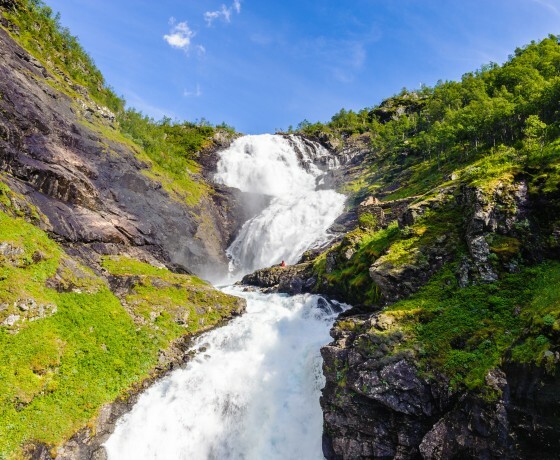 From easy guided hikes and the summer-skiing resort on the Folgefonna glaciers to the serious hiking trails that encompass waterfalls and panoramic vistas, Norway’s Hardangerfjord region offers truly exceptional outdoor experiences. Norway’s Queen Sonja is known to favor the hiking trails around the village of Kinsarvik so much that a tough 10-mile hike is named after her. At 100 miles long, the fjord is the fourth-longest in the world and plunges down almost a half mile at its deepest point. 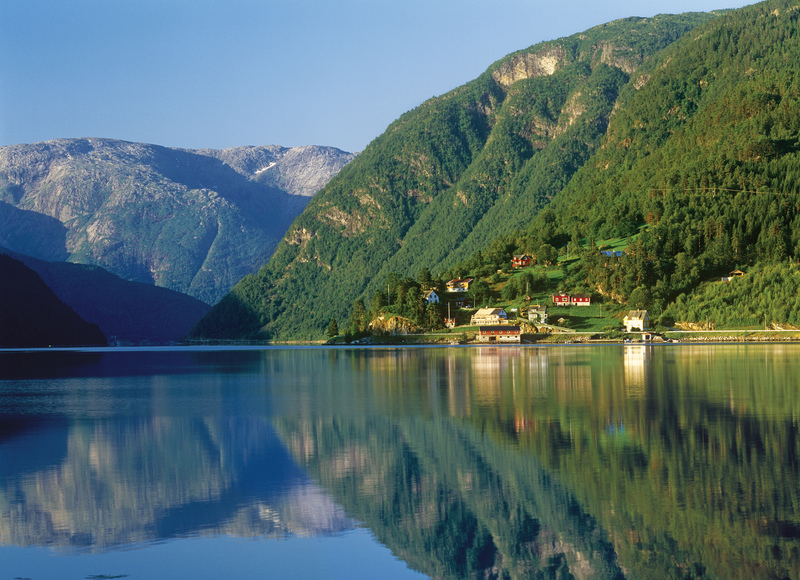 Take in the best of the landscape from the unique vantage point provided by the fjord as you sail inland from the island of Stord toward the ever-more-imposing mountains of the Hardangervidda National Park. Waterfalls, islands and shoreline villages dot the journey. Dangling more than 2,000 feet above Lake Ringedalsvatnet is the Troll’s Tongue, a unique rock formation and one of Norway’s most famous hikes—and photo opportunities. The deep waters of the fjord are home to plentiful stocks of fish, while brown trout and wild salmon fill the rivers and lakes of the region. The mountainous national parks east of the fjord are the natural habitat of wild reindeer herds, elk and the mountain fox. 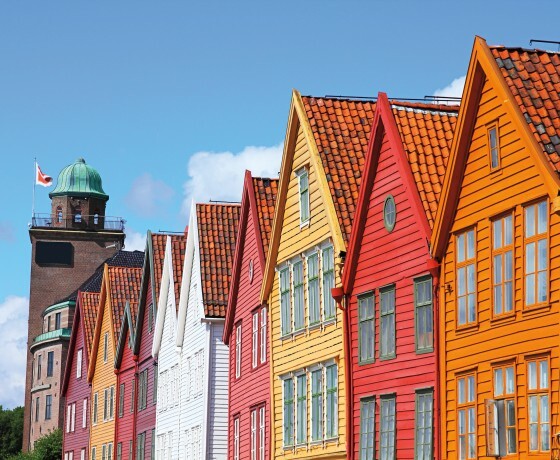 Beautiful Bergen, Norway’s second-largest city, is one of the most popular ports of call on a cruise up the fjords. Step off the ship into the medieval Bryggen wharf area, a UNESCO World Heritage Site since 1979, where small boats line the harbor and wooden gabled buildings stand proud along the waterfront. 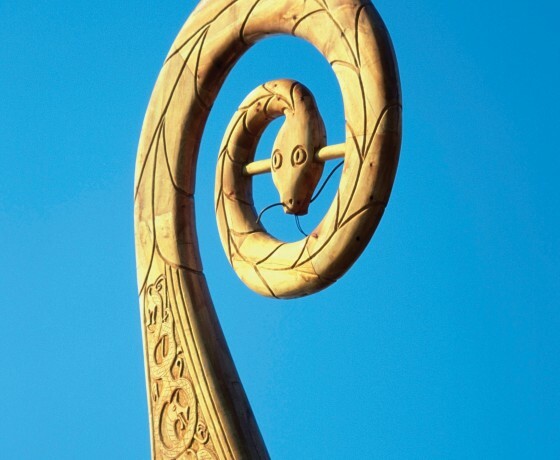 Bergen’s rich maritime tradition goes back nearly 1,000 years, including the years the town played an important part in the Hanseatic League, the trading empire that dominated maritime commerce in the region between the 14th and 18th centuries. 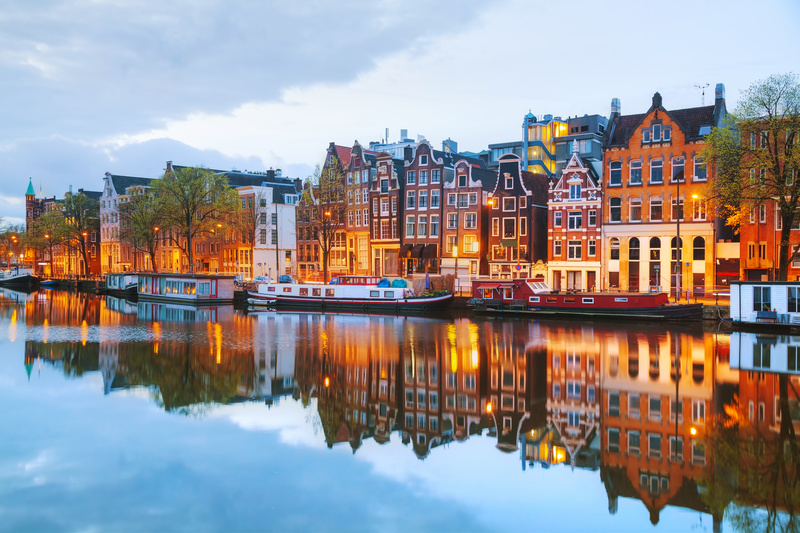 The city is one of Europe’s oldest settlements, and its cobblestone streets and narrow alleyways lead to emerald-green parks, medieval cathedrals and stone fortresses that kept enemies at bay centuries ago. It’s also eminently walkable, with historic buildings and excellent markets selling everything from fish and produce to trinkets and souvenirs. 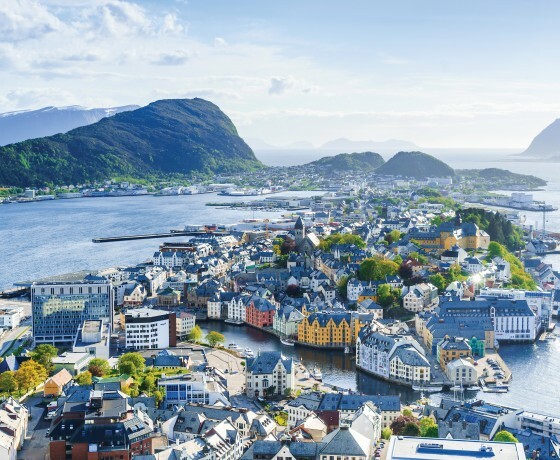 Surrounded by mountains and thick forest, and sitting halfway between Geiranger to the north and Stavanger to the south, Bergen offers plenty to do outside the city too. 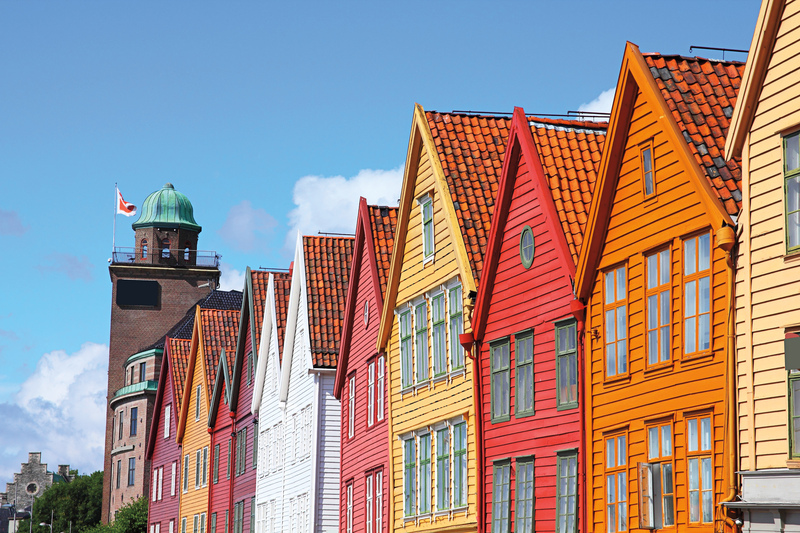 Whether you sign up for a guided excursion or venture out on your own, you’ll be sure to fall in love with Bergen. All of the stunning beauty you associate with Norway is on display in Molde, a city roughly 240 miles north of Bergen with white clapboard houses sitting alongside a sparkling fjord. On a clear day, more than 200 peaks are visible from this part of the Romsdal Peninsula. (The Varden Viewpoint, 10 minutes by car from the center of town, is the best place to take in the breathtaking panorama.) Even when the weather is less cooperative, there is plenty to do, with cozy cafés, boutiques selling woolen sweaters and the Romsdal Museum, an open-air folk museum where you can literally stroll through the region’s history and traditional homes. Molde is also one end of one of Norway’s most beautiful coastal drives, the Atlantic Ocean Road (in Norwegian, the Atlanterhavsvegen), which crosses spectacular bridges and a number of islands. 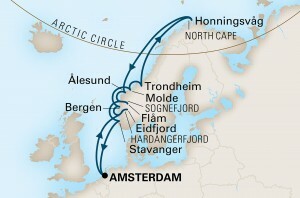 Around every bend, there are magnificent views of mountain peaks, the Atlantic and the fjords that notch Norway’s coast. From mid-June through August, Molde lives up to its nickname—the City of Roses—with flowers blooming everywhere, from the roof of the town hall and the university grounds to the picket fences around houses. For many travelers, the sparsely populated settlement of Honningsvag is nothing more than a pit stop en route to the North Cape, the northernmost point of continental Europe. 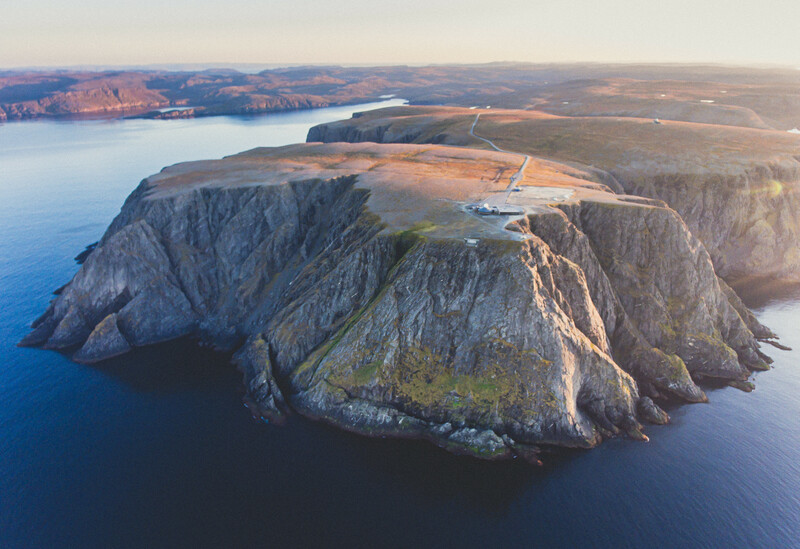 (The North Cape is rightly an iconic bucket-list destination with postcard views across the open ocean.) 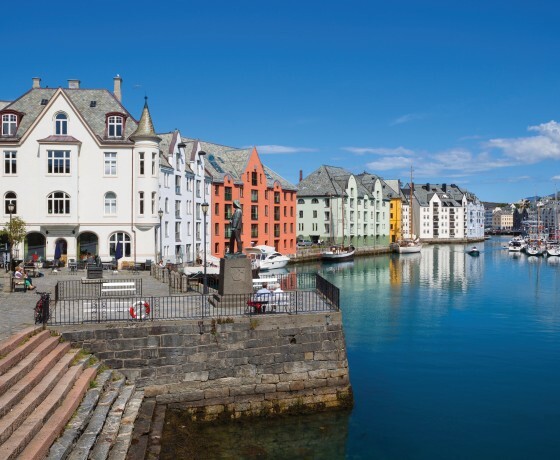 But amidst its colorful buildings, Honningsvag has a lively cultural life powered by local spirit and an economy driven by shipping through the Barents Sea, which is ice-free year round thanks to the warming influences of the Gulf Stream. The town’s several notable cultural institutions include a museum and a busy cultural center. Honningsvag is also a terrific base for exploring the rest of rugged arctic Norway, whether on foot, all-terrain vehicle or on the water. Back in town, be sure to stop by the statue of Bamse, the Saint Bernard dog that became the mascot of the Free Norwegian Forces during World War II. The city was destroyed in bombing during the war and the harrowing experiences of that period are documented at the church, which gave temporary shelter to the residents. The Nordkapp (North Cape) is a 984-foot-tall headland in northern Norway, commonly known as the northernmost point in Europe. 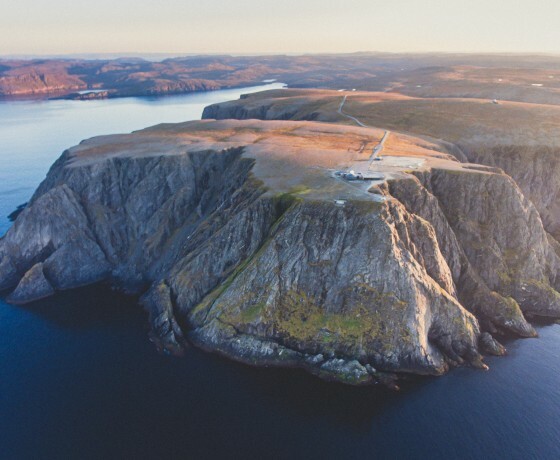 The views offered from the cape and an enjoyable visitor center keep that reputation intact, even though it’s not technically true; clearly visible from the North Cape, the slim peninsular Knivskjellodden is actually almost 1,500 feet farther north. 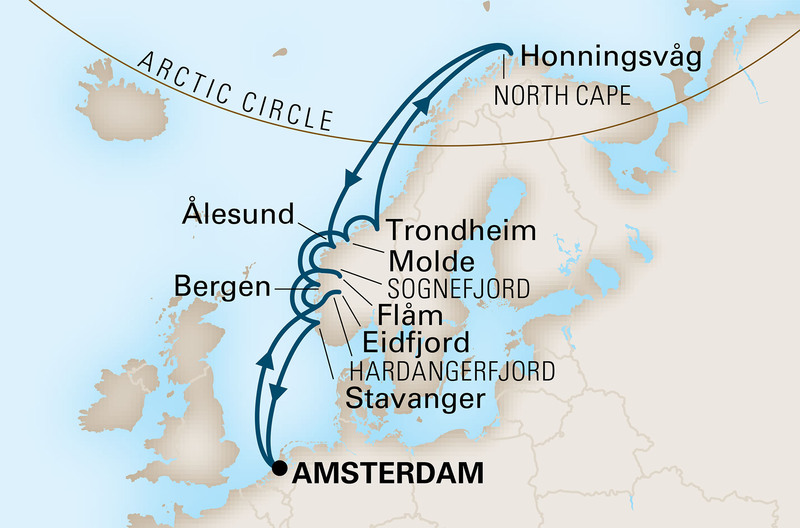 Sticklers for detail argue that because both points are on the island of Magerøya, neither should count, as the Norwegian Arctic archipelago of Svalbard is even farther north. Yet the attraction of the region is more than just a quirk of geography. The starkly beautiful, barren and often intimidating coastline of Finnmark contrasts with the majestic fjords to the south, and rare species of seabirds have made the few grassy islands their home. The region offers opportunities for sport beyond hiking, skiing and fishing: Sea rafting, in particular, is popular with locals. The North Cape served as the finish line for the 45 runners who completed the 2009 Trans Europe Foot Race, an ultramarathon that began in Bari, Italy (2,787 miles, away), and ended here 64 days later. 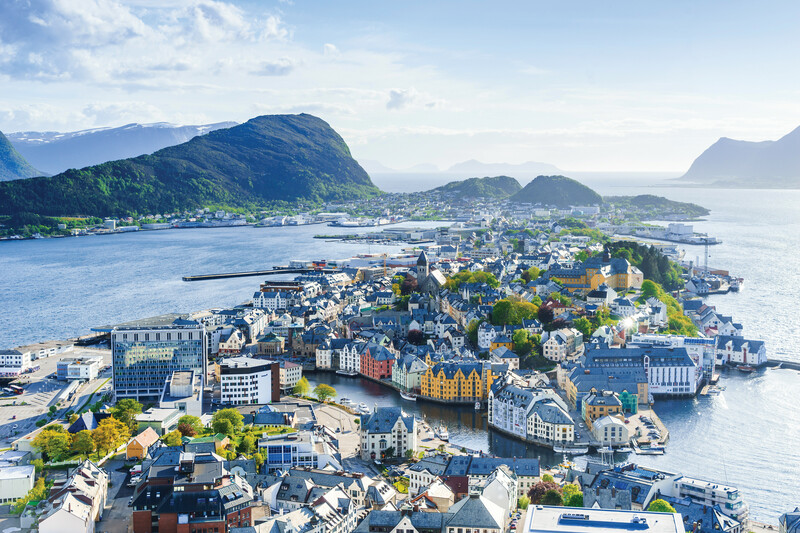 Alesund, a quaint fishing town of approximately 45,000 in western Norway, has been called Norway’s most beautiful city. A fire in 1904 destroyed much of it, resulting in the town being rebuilt in the Art Nouveau style—also known as Jugendstil—that was popular around the turn of the 20th century. A year after the fire, Norway gained its independence from Sweden, which led to a campaign to build a “Norwegian town” to mark the creation of the new nation. The colorful buildings feature castlelike turrets and spires with intricate facades of ornamental flowers, gargoyles and Viking-inspired decorations. 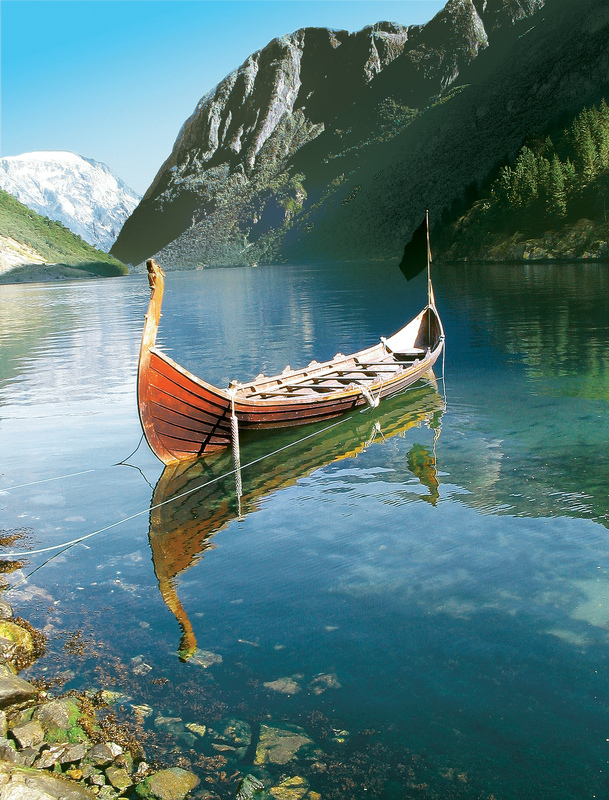 Bordering the Norwegian Sea, this area is also famous for its mountain ranges and fjords. 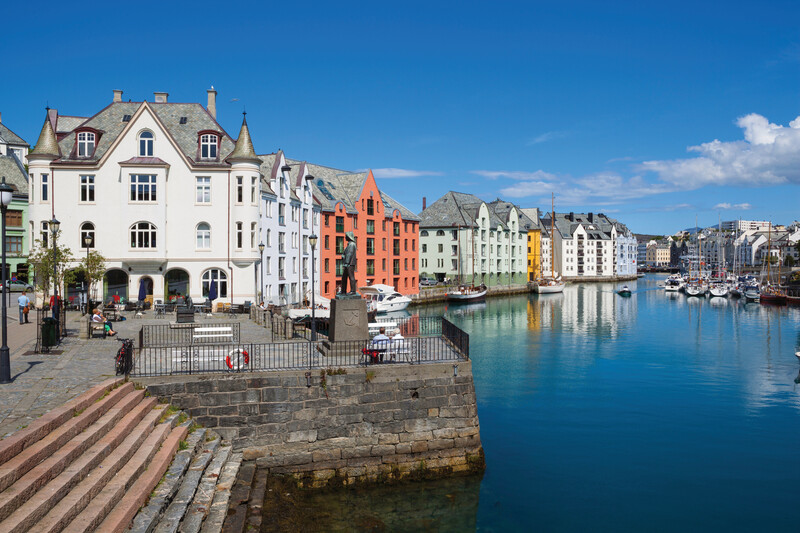 For those looking for a more active visit, Alesund offers great hiking, mountain biking and kayaking. One of the highlights is climbing the 418 steps that lead up Mount Aksla for a spectacular view of the city and the Sunnmøre Alps. 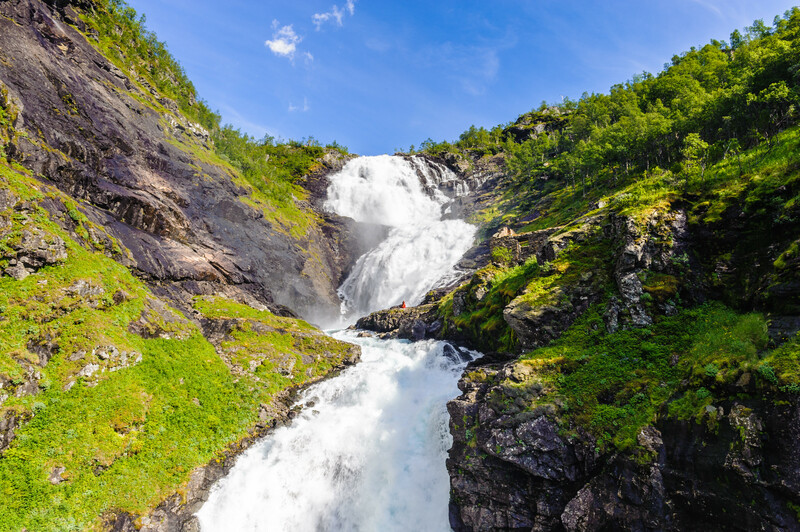 Nearby is the Geirangerfjord, a UNESCO World Heritage Site known for its beautiful waterfalls. This is also home to Atlanterhavsparken, or the Atlantic Sea Park, one of the largest aquariums in Europe. Off the Aurlandsfjord, a branch of the larger Sognefjorden in southern Norway, Flam—and its surrounding area—is a place to stop, gaze and linger. There are no traffic lights; instead the village has an easy pastoral rhythm. 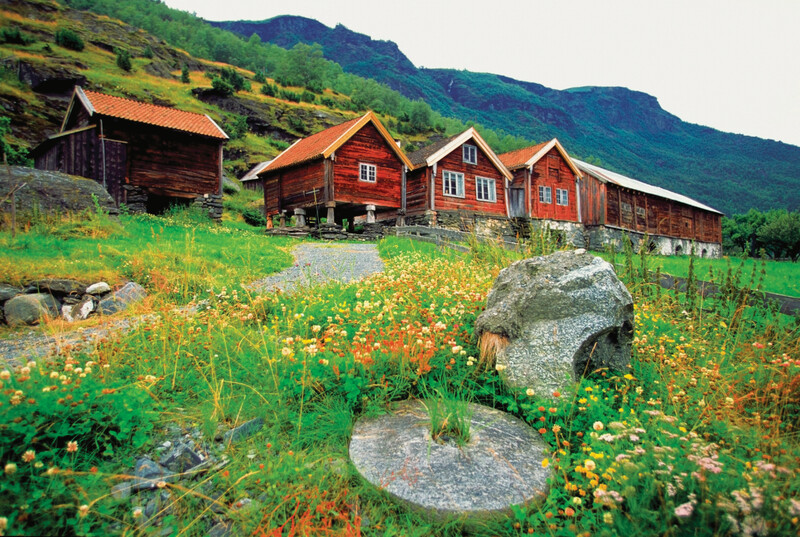 Explore the steep-sided fjords and hike through sweeping valleys and meadows, home to grazing sheep. See the frozen-in-time churches and architecture and visit traditional farms where geitost or brown goat’s-milk cheese is made. There are many ways to take in the majestically beautiful landscapes, some designated UNESCO World Heritage Sites, and many are easily accessible. You have only to pick and choose: Embark on a wildlife-spotting cruise through the fjords’ narrow passageways or go on a kayaking or cycling excursion that passes by gushing waterfalls. 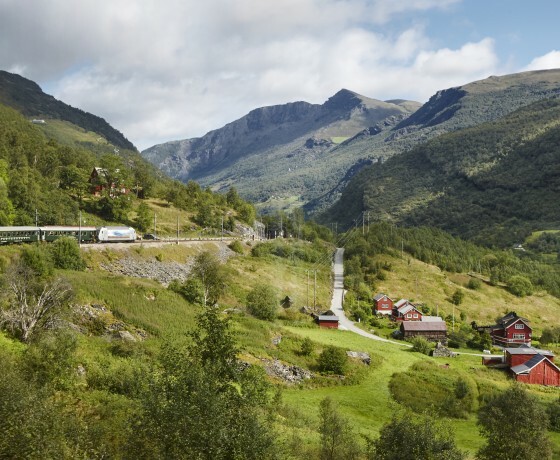 The Flam Railway runs on a winding route on sheer slopes. 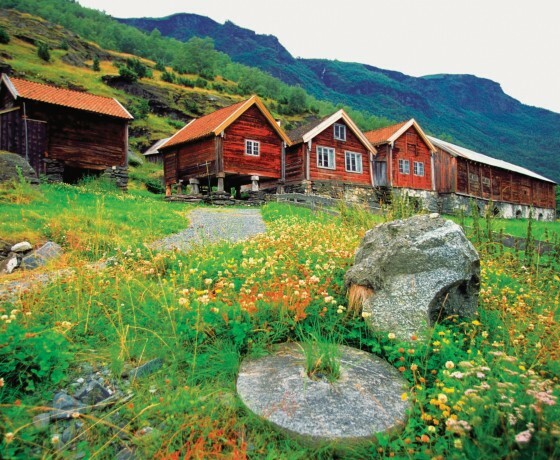 Or see the area at true Flam pace, with a simple picnic on the shore. 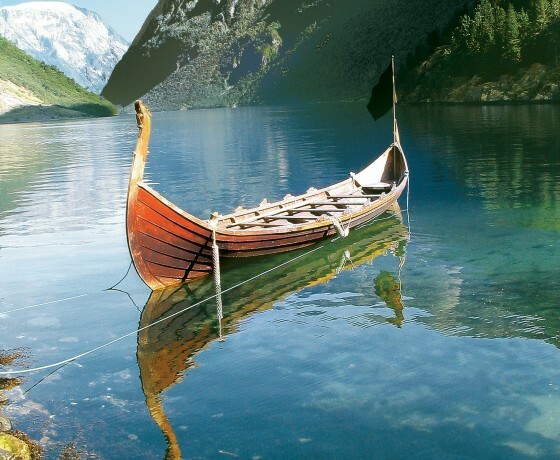 Norway’s Sognefjord is the longest and deepest fjord in the world. 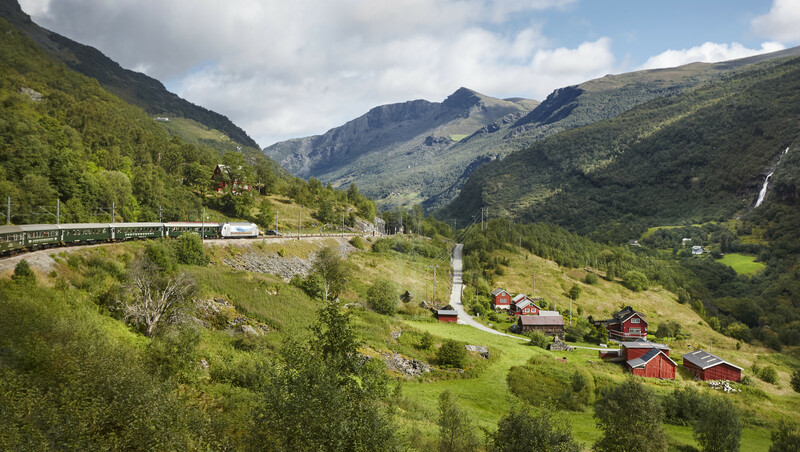 Imagine 127 majestic winding miles of beautiful villages, centuries-old architecture including wooden stave churches, towering mountains with snow-covered peaks, cascading waterfalls and panoramic views. It is also a region known for its traditional food, folklore, music and rich culture. Set in the southern part of the country, centrally located at the heart of Fjord Norway (as the region is known), the fjord reaches depths of more than 4,291 feet. It also soars to the sky, with rugged cliffs rising to more than 5,577 feet. This is nature at its most dramatic. 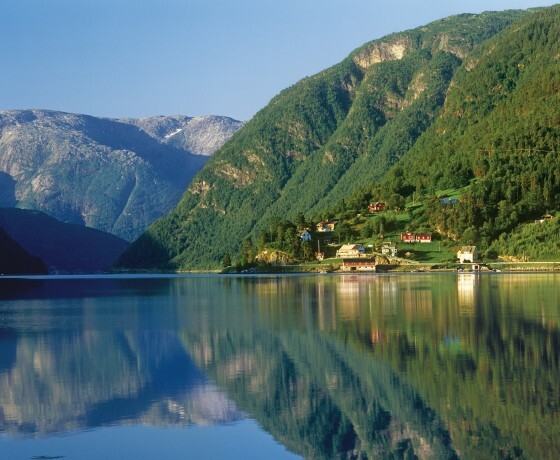 In fact, one of the Sognefjord’s arms, the Nærøyfjord, is on UNESCO’s World Heritage List. 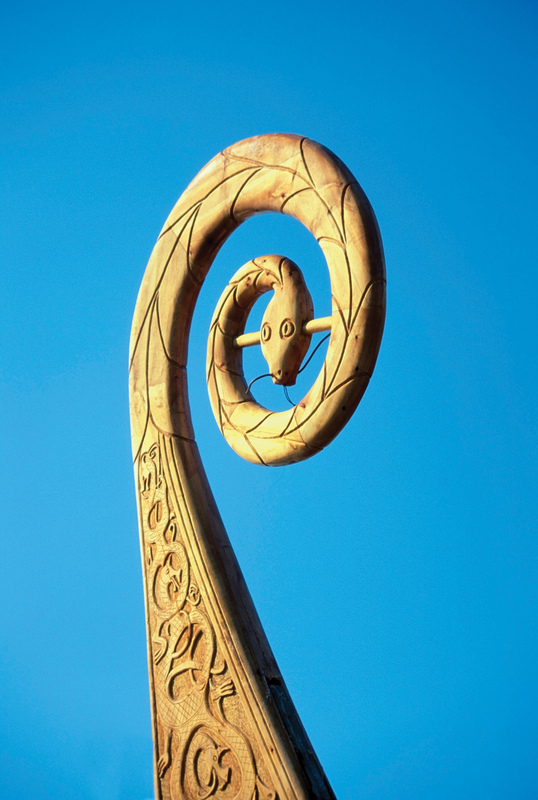 The Urnes Stave Church, which was build around 1130 is also included on UNESCO’s World Heritage List. As the poet John Keats once wrote, “The poetry of earth is never dead,” and within the Sognefjord lie many sonnets of life. Be inspired by its treasures. All you have to do is sit back and watch the spectacular wonder of this destination. Every great journey starts with the details. Here you can revel in light-filled spaces and dramatic architecture while delighting in the artistry of the evening’s dessert. Feel the impact of sound, movement and color–from a $4.1 million art collection to a perfectly held note from a live chamber music performance. Be inspired by the sophisticated interplay between technology and comfort, modern and timeless. At every turn, discover the thoughtful touches that elevate and elegant journey to a Pinnacle-class experience. Rates do not include port taxes of $165 per person. Double pricing is per person based on double occupancy or two people per stateroom. Single pricing is based on single occupancy or one person per stateroom. Single and 3rd/4th person pricing is capacity controlled and subject to change. Roundtrip airport transfers are an additional $58 per person (optional). 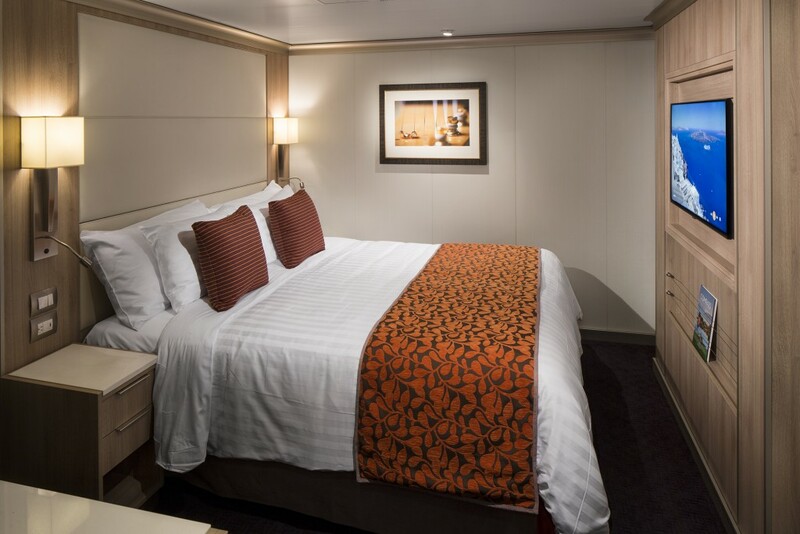 All staterooms feature a signature Mariners Dream bed made up of finely woven cotton linens, Elemis Aromapure toiletries, 100% Egyptian-cotton towels, daily fresh fruit at your request, bath robes, 24-hour room service, and on-demand TV. Suites feature your own spacious verandah, a large sitting area, and fresh flowers. Neptune and Pinnacle Suites provide access to the Neptune Lounge, the services of a personal concierge, and more. 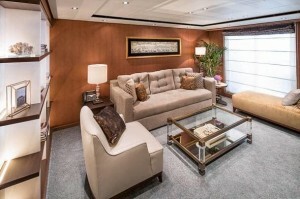 Inside Stateroom | Decks 1, 4–8 | 141–225 sq. 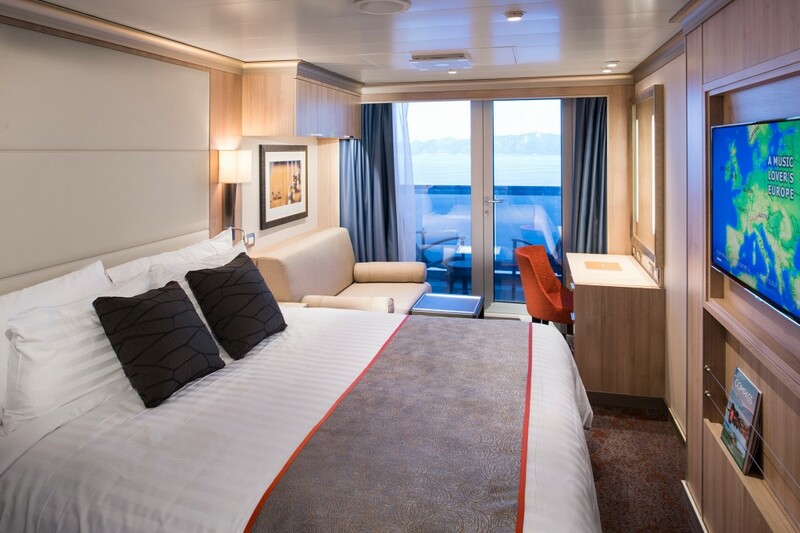 ft.
Two lower beds convertible to one queen-size bed—our signature Mariner’s Dream™ bed with plush Euro-Top mattresses, premium massage shower heads and a host of amenities are featured in these comfortable staterooms. 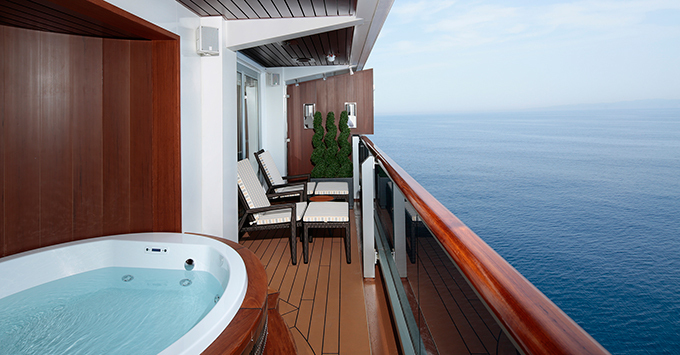 Ocean View Stateroom | Decks 7, 11 | 175–282 sq. ft. 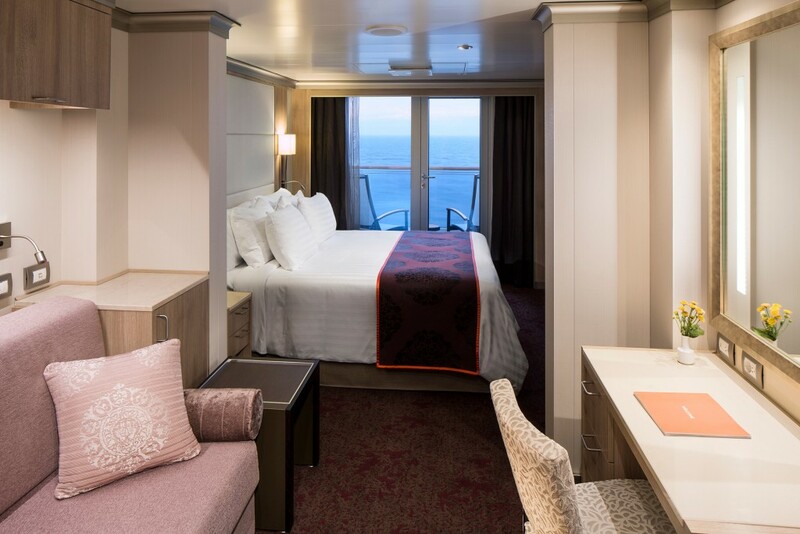 These expansive staterooms include include two lower beds convertible to one queen-size bed—our Signature Mariner’s Dream™ bed with plush Euro-Top mattresses, premium massage shower heads, a host of amenities and an ocean view. 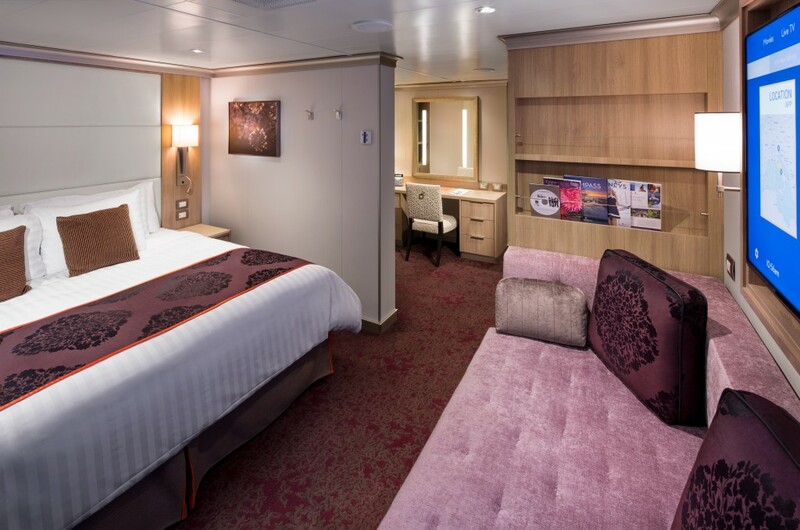 Verandah Stateroom | Decks 4–8, 11 | 228–405 sq. ft. 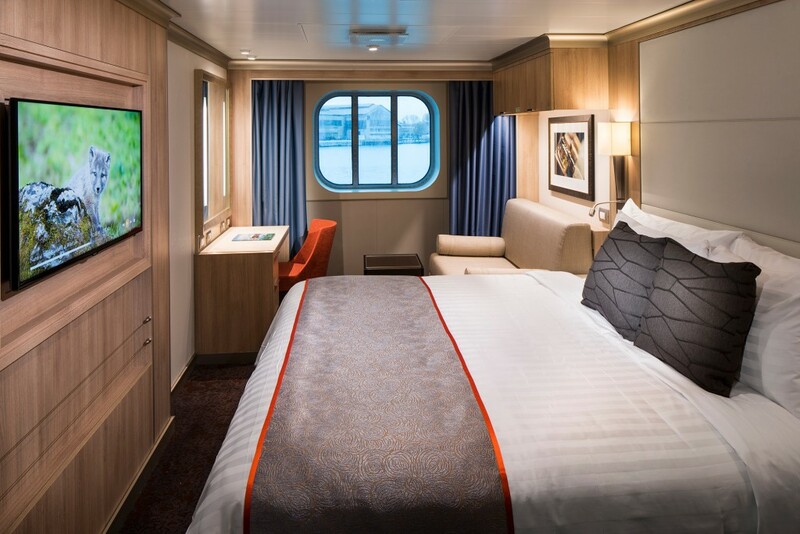 Filled with light from floor-to-ceiling windows overlooking a private verandah, these staterooms include a sitting area, two lower beds convertible to one queen-size bed—our signature Mariner’s Dream™ bed with plush Euro-Top mattresses, and shower. Vista Suite | Decks 4–8 | 260–356 sq. ft.
With a verandah, floor-to-ceiling windows and comfortable sitting area, these comfortable suites are filled with light. They include two lower beds convertible to one queen-size bed—our signature Mariner’s Dream™ bed with plush Euro-Top mattresses, plus a mini-bar. Signature Suite | Deck 7 | 393–400 sq. ft. These large, comfortable suites feature a spacious sitting area with floor-to-ceiling windows overlooking a private verandah, two lower beds convertible to one queen-size or king-size bed—our signature Mariner’s Dream™ bed with plush Euro-Top mattresses, one murphy bed for one person, and one sofa bed for one person. The bathroom includes a dual-sink vanity, full-size whirlpool bath and shower, and an additional shower stall. Neptune Suite | Decks 7, 11 | 465–502 sq. ft.
With floor-to-ceiling windows overlooking a private verandah, these spacious suites are flooded with light. They feature a large sitting area and two lower beds convertible to one king-size bed—our signature Mariner’s Dream™ bed with plush Euro-Top mattresses. 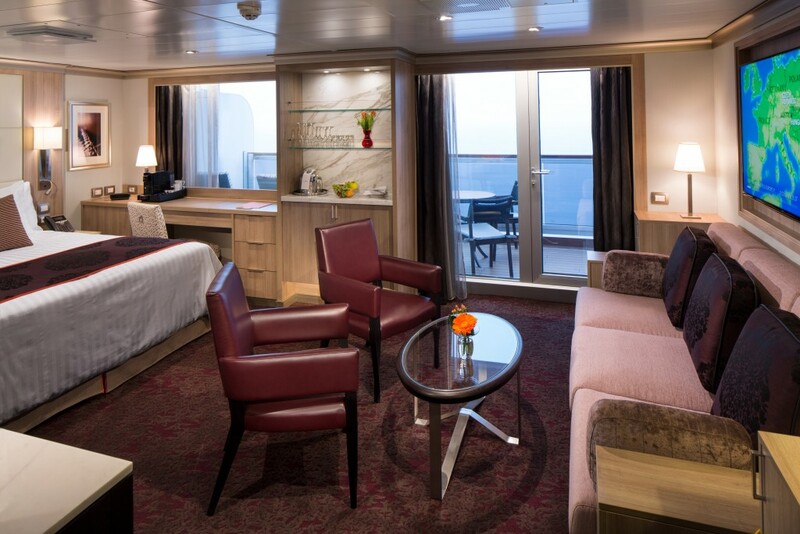 A very special amenity exclusively for guests cruising in a Neptune Suite, the industry-leading Neptune Lounge features a private place to relax, socialize with other suite guests and enjoy the personalized service of a concierge. The fleet-wide lounges provide worktables, large screen television, library, sofas and chairs, refreshments throughout the day and Wi-Fi for a small charge. One-Touch 24-hour Concierge Service is available when the Neptune Lounge is closed. Pinnacle Suite | Deck 7 | 1,290 sq. ft. Generously proportioned and filled with light, these elegant suites include a living room, dining room, pantry with microwave and refrigerator, and floor-to-ceiling windows overlooking a private verandah with whirlpool. The bedroom features a king-size Signature Mariner’s Dream™ bed with plush Euro-Top mattresses, and the bath includes an oversize whirlpool bath and shower as well as an additional shower stall. There’s also a sofa bed, suitable for two people, and a guest toilet. Amenities include a private stereo system, use of the exclusive Neptune Lounge, private concierge and an array of complimentary services. A very special amenity exclusively for guests cruising in a Pinnacle Suite, the industry-leading Neptune Lounge features a private place to relax, socialize with other suite guests and enjoy the personalized service of a concierge. The fleet-wide lounges provide worktables, large screen television, library, sofas and chairs, refreshments throughout the day and Wi-Fi for a small charge. One-Touch 24-hour Concierge Service is available when the Neptune Lounge is closed.